Tractor Driven Generators are designed, engineered and built to provide instant emergency power in the event of a power failure. 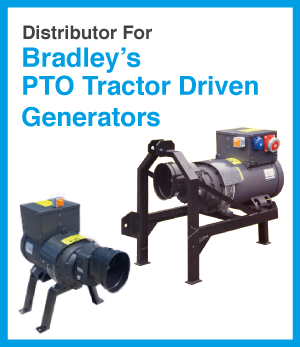 Just a few points to consider before you purchase a PTO Generator. (A) Good starting torque for motors. (B) Excellent longevity for a prolonged power outage. (D) Speed indicator to ensure tractor PTO speed is accurate. (E) Circuit breaker to cover for protection of generator. If you purchase a generator that runs at 3000RPM points A-C are not at all as efficient as a machine that turns at 1500RPM. Therefore the build quality is superior. However this does add expense. When power is imperative do you really have an option? We would be pleased to discuss your requirements or any questions you might have. or by phone on 07795 655 153.